Rich, smooth, dairy-free cream cheese made with silky almonds. Enjoy it on Paleo toast, as a veggie dip or mixed in with zoodles! 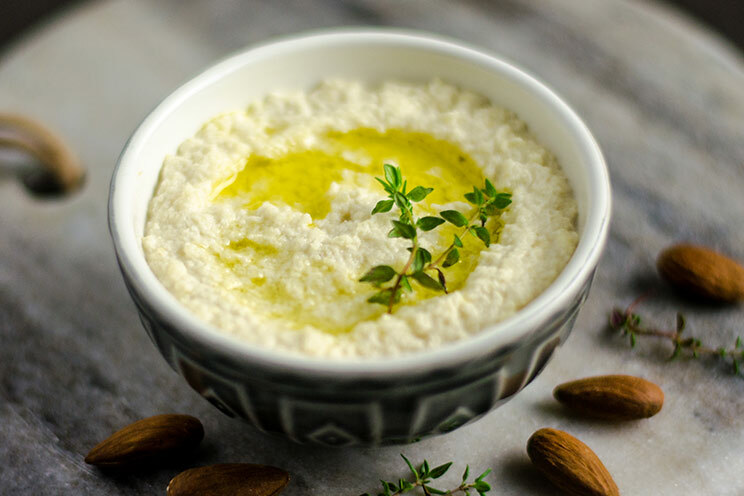 This savory cream cheese is made with silky almond, keeping things healthy and dairy-free. To create a smooth texture, the almonds need to be soaked. Soaking them also helps reduce the amount of phytic acid, making them easier to digest. Drain and rinse the almonds, then rub them with a towel or in between your fingers to pop the skin off. 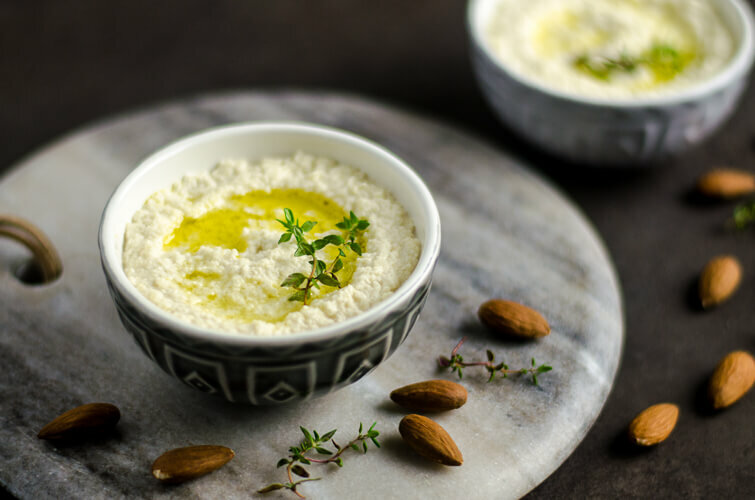 Tip: Once you try this basic recipe for almond cream cheese, you can add your own spices and herbs to adjust it to your taste. For an herb cream cheese, add 1 teaspoon of fresh thyme or parsley and drizzle with olive oil. For sweet cream cheese, leave out the salt and vinegar, add one tablespoon of raw honey and a few drops of vanilla extract. You can also stir in fresh blueberries, peaches or strawberries into this yogurt-like cream cheese. This recipe makes about one cup. If you are using a large-sized food processor, you may need to double the ingredients to ensure that the ingredients fill up the bowl enough for adequate blending. Leftovers can be kept in an airtight container in the fridge for up to 5 days or in the freezer for up to one month. Remove the skin by rubbing the almonds with a dry towel or pinching them between your fingers. In a food processor, place the almonds, water, salt, apple cider vinegar and lemon juice. Blend on high for 1-3 minutes until smooth and creamy. Stir in the flavoring (if using any) and blend again until combined. Store in an airtight container in the fridge for up to 5 days or in the freezer for up to one month.